The Instron 3344 single column system is designed for both tension and compression tests less than 2 kN (450 lbf). The system is ideal where portability and/or lab space is at a premium. 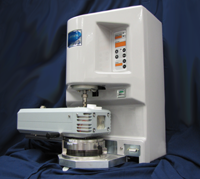 The 3344 system is a simple to use system that offers both performance and affordability for quality control and product testing and the 42" test space allows for a wide range of sample sizes. The available 10lb. and 450lb load cells work well for testing thin sheets, individual fibers, or low strength tensile test specimens. The Malvern Bohlin Gemini II Rheometer with the ETC and CVO2006 Peltier incorporates a patented Rotonetic 2 drive with adaptive control technology allowing solid and fluid capability optimized for both strain controlled and stress controlled operation. It has a broad torque range extending to 200 mNm making the Gemini suitable for a wide range of applications. The ETC is a forced gas oven ensuring rapid temperature changes (from -150C to 550C) with excellent conductivity and minimal thermal gradients within the sample. The Peltier system avoids the necessity for a separate fluids circulator with a cup and bob measuring system and is designed with rapid temperature changes in mind and allows ramping rates of 30C per minute. The TA Instruments Q800 Dynamic Mechanical Analyzer is for viscoelastic measurements from 1 kPa to 1,000 GPa with a temperature and frequency range from room temperature to 600 C. The amplitude range is 0.5 to 10,000 microns with a resolution to 1 nanometer. 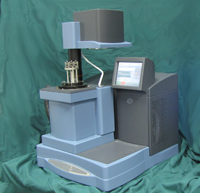 The Q800 provides ultra-sensitive force measurements down to 0.0001 Newtons, which can fully characterize the viscoelastic response of individual fibers (through the Film and Fiber Tension Kit) and the resin (through the Three Point Bend fixture or the Dual Cantilever Beam fixture). The Gas Cooling Assembly is included as well to allow the full utilization of thermal loadings down to -150 C.